The Aiken Land Conservancy is proud to announce our new office location at 300 Park Avenue in Aiken, which has been made possible by the generous donation of two long-time supporters. The opening of a bricks and mortar office is an important benchmark in our development. Not only does it provide a place to conduct organizational business and meet with potential donors and supporters, the office in the handsome, renovated historic building at the corner of Fairfield and Park will increase our visibility and within the community. Please drop by when you are in the neighborhood. 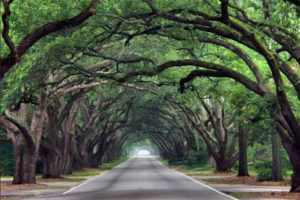 The mission of the Aiken Land Conservancy is to protect Aiken’s unique character and cherished natural resources—to protect the places that make Aiken such a special place to live, work and raise a family. Since it was founded in 1990, the Land Conservancy has protected close to 3,500 acres in the city and the county. Aiken Land Conservancy owes our strength and success as a non-profit organization to those who have served on the board since it was founded. Our past Presidents were founders and innovators who believed in the value of conservation, who understood that once those natural and historic places we cherish are gone—they are gone forever. We and the citizens of Aiken owe a great deal of gratitude to those leaders. My immediate predecessor, Larry Comegys, served as president of the board for four years (2012-2016). 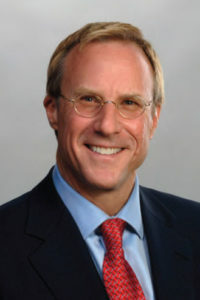 He was instrumental in shaping ALC into an organization that addresses the changing attitudes and increasing responsibilities of modern-day conservation organizations. Under Larry’s leadership, ALC attained national accreditation from the Land Trust Alliance, a prestigious designation awarded only to land trusts with the rigorous organizational and financial practices necessary to ensure public trust and donor confidence. 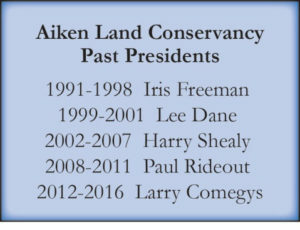 Larry’s term with Aiken Land Conservancy expired in 2016. He remains an active participant on the Advisory Committee. Our current Board of Trustees are an equally dedicated group of people who bring their various skills to bear in protecting the things you love about Aiken. They are Steen Smith (Vice President), Jim Cunningham (Treasurer), Frampton Toole, Wilkins Byrd, Thomas Coleman, Lisa Darden, Kirk Henckels, Nancy Henze, Rob Johnston, and Lydia Rose. I urge you to take a moment to read their bios on our website, Their efforts are tireless and professional and make my job seem almost effortless. Finally, the day-to-day work of ALC could not be accomplished without our extraordinary Executive Director, Katie Roth, and our highly accomplished Administrator, Janet DePrince. Katie manages to maneuver through all these personalities and develop our various initiatives with intelligence and grace. Her judgment is impeccable. Janet’s steady attention to our organizational and financial detail is nothing short of amazing. I sleep better at night knowing that she is watching the administrative challenges of our ever-growing organization. 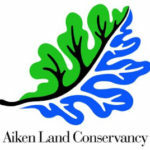 Today, the Aiken Land Conservancy does so much more than just protect tracts of land. We are partnering with the City to protect our magnificent trees, restore our parkways, and create a voluntary conservation program for Shaw’s Creek, an important source of drinking water for the City. 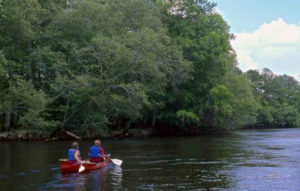 In addition, through our Edisto River initiative, we are working to protect the headwaters of the Edisto River, the longest unimpeded blackwater river in the country, from the ravages of unsustainable agricultural and logging practices and unmonitored water withdrawal. 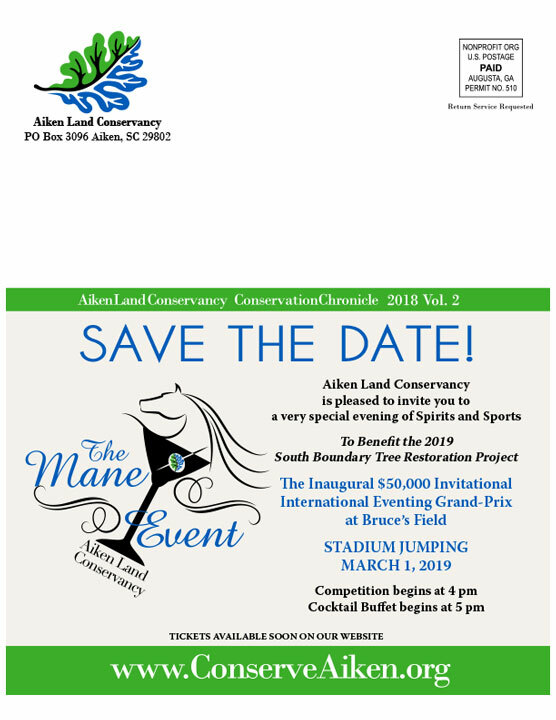 Thank you for investing in protecting our natural and historic treasures and for believing in the Aiken Land Conservancy.